Black and white and cute all over, penguins delight and fascinate zoo visitors. But there's more to this hardy group of ocean-dwelling birds than meets the eye. From Antarctica to the equator, birds in the Order Spheniscidae have adapted to an existence that is tied to the land and to the sea. Keepers, interpreters, guides, and docents can explore the fascinating life of these birds as the San Diego Zoo Global Academy presents the two newest modules in Introducing Animals, our series about animal species and other taxonomic groups. Introducing Animals: Penguins explores the behavior, ecology, reproduction, and conservation of this unique order of birds. Introducing Animals: African Penguins presents more detailed information about this endangered species, including historical and current threats, and what is being done to help save them. Dive into their wet and wild world, and discover details of how these birds behave. Remarkable images show them in ways you've never seen before, and video provides insights into their behavior. Interactivity sprinkled throughout the modules engages participants in the learning process, and questions at the end of each section ensure that they have mastered fundamental concepts before they move on. 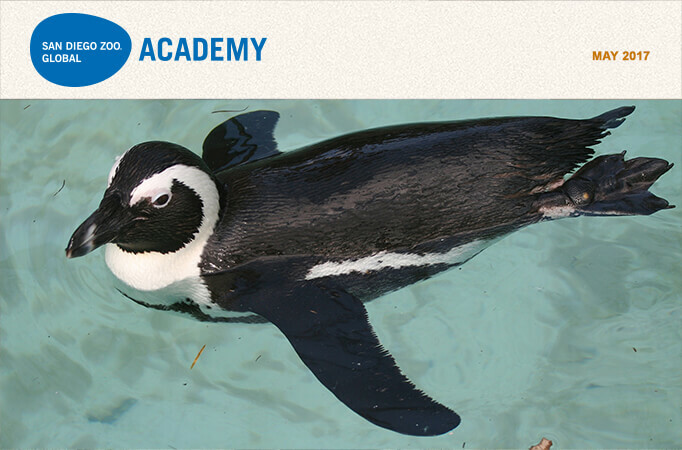 The Penguins module takes about 90 minutes to complete, and the African Penguins module takes about 60 minutes to complete—although participants progress at their own pace and may repeat the entire course or sections of the course as many times as they like. Introducing Animals: Birds is a recommended prerequisite. The Introducing Animals modules can easily be integrated into your current training program. Participants can complete online modules on their own before attending group training programs. They are able to master key vocabulary and concepts, giving them a solid foundation that allows them—and their trainers—to make the most of in-class and on-site training. Click here to view samples of the new penguin courses! By the way, Happy World Penguin Day! Watch the video here. Click here to check out the NEW Penguin Cam at the San Diego Zoo. 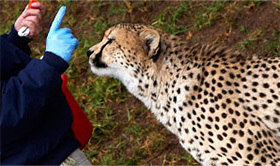 For questions related to this article, please contact Donna Parham, San Diego Zoo Global, at dparham@sandiegozoo.org. Academy Publishes 50th Edition of the Newsletter! Please click here to access our archive of Academy newsletters. Onward! Please join us for the Administrator's Users Group Webinar, hosted by Academy partner CypherWorx. The next webinar is Wednesday, May 17, at 11 a.m. PDT. Manual Materials Handling—This course is designed to teach participants safe practices for lifting and handling materials, which can help prevent back injury. Participants will learn how and why back injuries occur, preventative techniques to take when lifting heavy materials, as well as some common material handling devices that can be used to prevent injuries from occurring. San Diego Zoo Global Academy Puts BREC’s Baton Rouge Zoo In The Spotlight! BREC’s Baton Rouge Zoo in Louisiana is part of the Academy’s collaborative learning environment! In January, I shared with you that it takes courage to launch into the unknown. Since then, we have been comparing the many similarities between launching the Academy online staff training program at your institution to taking a sailing voyage. Last month, we looked at the currents that are common to both oceans and organizations. Currents and wind can propel you toward your destination, or currents can create drag and slow your progress. So, how does one make forward progress when the prevailing wind is coming from the direction of your destination? The nautical term “tack” is at least 400 years old, and it means sailing diagonally at about a 45-degree angle to the wind. A tacking strategy is used whenever the wind doesn’t cooperate with making a direct approach toward the destination. At first, tacking seems counterintuitive. How is it possible to make any forward progress, when the majority of the time, a tacking boat isn’t even pointed toward the destination? Tacking is a zigzag course used to make forward progress incrementally. True, while on a tack, the forward progress is much slower than you might like or want, but it is forward progress. On occasion, that zigzag course is a sailor’s only option for forward movement. Don’t be discouraged by the need to tack, because if you keep your eyes on the chart and your final destination, you will be making progress. Of course, there is another option. You could drop the sails, and drift with the winds and current away from your goal, hoping the conditions will change and become more favorable. However, this is not much of a plan, and that is why sailors learned to tack. When conditions require tacking, the vessel might travel two or three times more distance than with the direct approach, but progress is still made, not lost. The experienced sailor knows that the wind and currents won’t always be in opposition to the destination. And while tacking, savvy sailors keep their thoughts fixed on this knowledge. They know that incremental progress is still progress. Helpful Tip: A few months ago, we learned that the chart is used to plot distance traveled and course direction. The chart can also measure a ship’s speed as a variable of time and distance traveled. Sailing with the wind and currents at your back is wonderful. Sailors refer to it as “sailing downhill,” because both the wind and currents work together to push the vessel forward at the fastest possible speed. If your staff is struggling with the two hours needed to complete a course from the professional certificate series, challenge them to take a couple of webinars. You will find some interesting webinars in the new webinar section of our website. In addition to the Academy’s website, the 2017 Academy Reference Guide can be a valuable tool for your own institution’s journey. Send me an email here if you would like your own version of the 2017 Academy Reference Guide. For any questions, contact Gary Priest, curator of animal care training, San Diego Zoo Global Academy, at gpriest@sandiegozoo.org. To keep ahead, each one of us, no matter what our task, must search for new and better methods, for even that which we now do well must be done better tomorrow. Changing ourselves, our organizations, and our world for the better starts here, with each one of us doing our part to better serve animal interests and well-being. Taking ownership of our calling to serve empowers us to make a real difference. One way to keep moving forward is through continuous learning and consciously directed growth. This Academy newsletter, the 50th issue, is a constant source of learning. Gary Priest’s column on advancing your organization, and yourself, through training and professional development has broad and insightful application. Difficult conditions may appear to impede zoological organizations and the zoological community, as well as many animal-related causes and organizations. These external factors, like the headwinds Gary writes about this month, do not prevent our progress, but actually challenge us to think differently, so that we may learn and overcome these things as we invest in ourselves as instruments of change and progress. Please email me at jfg@excellencebeyondcompliance.com to share the good you are doing (as only you can), or with any comments or questions on this column or suggestions for future ones. For upcoming workshops and sessions, contact: info@excellencebeyondcompliance.com. © 2017 James F. Gesualdi, P.C. The opinions expressed herein are solely those of the author. This is not, nor should it be construed as, legal advice.